Forest Home is known for having a significant presence of union organizations. Among these are the International Alliance of Bill Posters and Billers and the Cigar Makers International Union. Many well-known labor leaders are also interred there. In fact, the most celebrated monument in Forest Home marks the graves of martyrs who fought for the eight-hour workday. 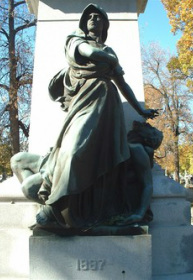 The Haymarket Martyrs’ Monument is the only grave marker in the US to be designated a National Historic Landmark. It marks the final resting place for the Haymarket “rioters” Adolph Fischer, George Engel, Samuel Fielden, Michael Schwab, Louis Lingg, Albert Parsons and August Spies.